Never Go Hungry Again with Find Me Food! You’re stuck with a light wallet and an empty stomach. How do you know which restaurants you can afford? 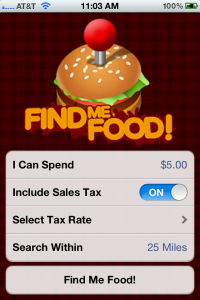 Never leave anything to chance again with Find Me Food! (iTunes link) developed by Studio Bebop. This app is perfect for travelers who are looking to eat on a tight budget. Find Me Food! features a clean and straightforward interface. Simply enter the amount of money you can spend, choose whether or not to include sales tax, and select the maximum distance you’re willing to travel. Don’t know your state’s sales tax rate? No problem; rates are listed by state, so guesswork is eliminated. 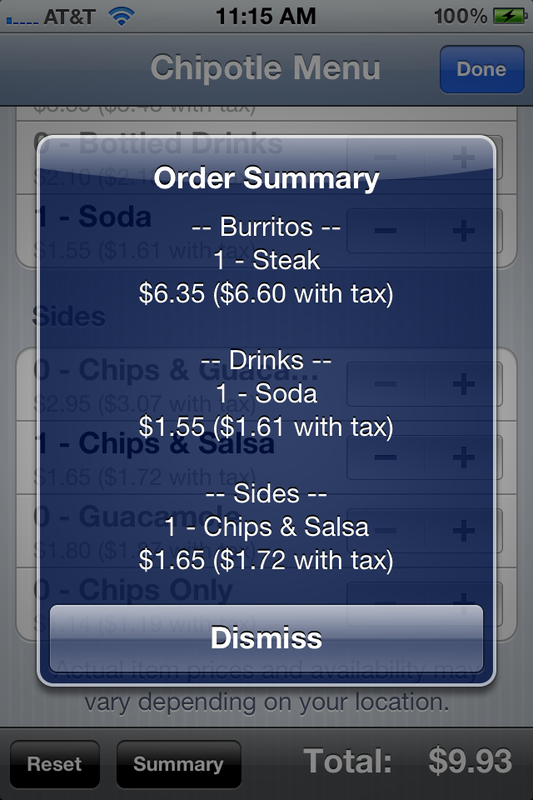 Another amazing feature is the ability to view entire restaurant menus. 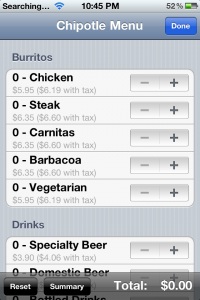 You can choose items which will fit within your budget, and the menu only shows foods you can afford. Personally, one thing I absolutely love about the menu function is items which exceed your budget are greyed out as you select what you want to order, saving you the hassle of manually tallying up your total order cost. This is a huge time saver, meaning you’ll spend more time eating and less time calculating. 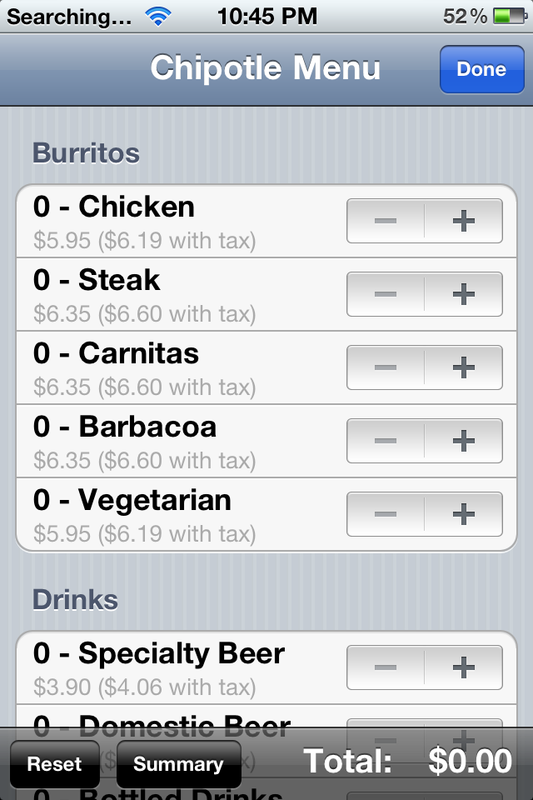 If you’re the type of person who gets hungry but never quite knows what to order, this is definitely the app for you. You’re sure to discover new restaurants and menu items within a matter of seconds, satisfying both your stomach and your wallet. 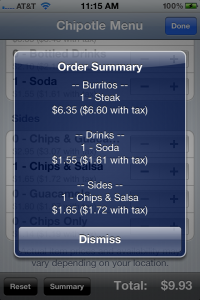 Perhaps someday the app will feature a way to take advantage of online ordering (similar to Chipotle and various large pizza chains). Find Me Food! 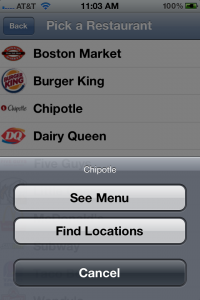 is landscape capable, making it easier to view restaurant menus. 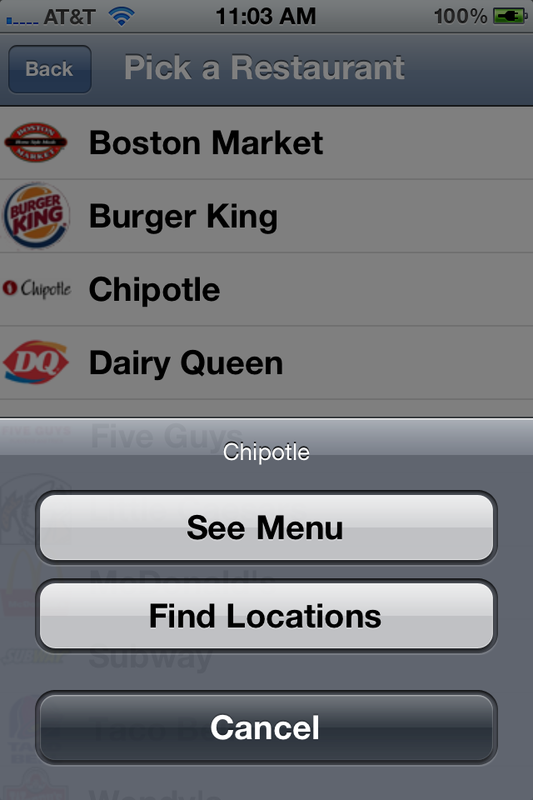 According to the app’s iTunes page, Find Me Food! currently only supports calculating budget options with United States Dollars. Find Me Food! (iTunes link) is compatible with iPhone 3GS, iPhone 4, iPhone 4S, iPod touch (3rd generation), iPod touch (4th generation) and iPad. Requires iOS 4.0 or later. A small expedite fee was paid by the developer to speed up the publication of this review.